The Organization of American States (OAS) AMA | Art Museum of the Americas, in collaboration with the Permanent Mission of Mexico to the OAS, and the Mexican Cultural Institute, present Palimpsestus: Image and Memory. The seventy artworks on display, produced between 1900 and 2014, include more than 30 artists from ten different countries drawn from Colección Memoria, assembled around artistic activisms by exhibition curator Alejandro de Villota Ruiz, and a selection of iconic modern and contemporary pieces from OAS permanent art collection. Palimpsestus: Image & Memory surveys the main artistic trends and visual cultures that have developed in Latin America in the second half of the 20th Century. The term Palimpsest, a capitalistic practice stemming from the scarcity of paper as a good for fifteen centuries, is appropriated by the curator to conceptualize the relativity and interrelation of art narratives and aesthetic discourses. It explores art movements from abstraction to new figuration as well as collective memory, through an experimental curatorial exercise based on anachronistic and antagonistic visual essays. Taking its methodological frame from Aby Warburg’s Atlas Mnemosyne and from Harald Szeemann’s catalyst exhibitions, Palimpsestus aims to become a posteriori and an empirical source of interpretation and critical thinking. Three axes of the curatorial script deconstruct artistic linear chronologies and geographical artistic paradigms, in an attempt to discover the primitive traces that remain invisible along the surface of our contemporary visual culture. Firstly, mainstream aesthetics are introduced in A(rt)nachronism, followed by two subsequent curatorial universes, The Bestiary, and Diaspora: Reconstructing Identities reflecting on the exile of artists to Latin America during the Spanish Civil War (1936-1939), which operate both as parallel and underlying imaginaries to canonic views. The exhibition’s core lies in the Bestiary, containing The Grays (1970 – 1976) by the Spanish artist Javier de Villota (b. 1942, Madrid) referring to the popular name of Franco´s armed police forces. These 20 drawings mark the entry into a convulsive period initiated with the ‘68 student movements’ extension, the unrecognized Nigerian secessionist nation of Biafra (1967-1970), and the ‘70s decade, during which active dictatorial regimes existed both in Europe and in Latin America, and where freedom of expression and other liberties continued to be an illusion in many countries around the globe. 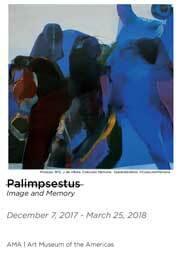 Palimpsestus: Image and Memory is part of AMA’s exhibitions program showcasing contemporary artists of OAS member countries. AMA is part of the OAS’s Secretariat for Hemispheric Affairs, and its work is based on the principle that the arts are transformative for individuals and communities, as visual components reflecting the four pillars of the OAS: democracy, human rights, security and development. Exhibition Artists: Yolanda Andrade, José Balmes, Gracia Barrios, Luis Brito, Roser Bru, Juan Carlos Cáceres, Inés Córdova, Carlos Cruz-Diez, José Luis Cuevas, Ernesto Deira, Juan Downey, Paz Errazuriz, Roberto Fanztozzi, Marisa González, Muriel Hasbun, Graciela Iturbide, Gyula Kosice, Guillermo Núñez, Roberto Matta, Leopoldo Méndez, Pedro Meyer, Marco Ugarte, José Clemente Orozco, Marta Palau, José Guadalupe Posada, Roberto Schettini, Javier Silva Meinel, Joaquín Torres García, Jorge de la Vega, Osvaldo Vigas, Alejandro de Villota, and Javier de Villota. Alejandro de Villota Ruiz is a cultural entrepreneur, independent curator, and artist, and a collaborator with the Museum of Fine Arts of Houston as part of the critical documents digital network project International Center of the Arts of the Americas, ICAA. His main multidisciplinary research lines relate Art History with Economics, Memory, Exile, Mexican 68 and Chilean 60’ & 70’s. Currently enrolled in the Art History PhD program of Complutense University, Spain. He lives and works between Spain and México.